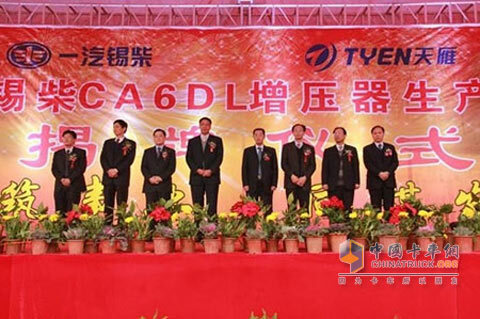 On February 7, the unveiling ceremony of FAW Xichai CA6DL supercharger production line was held in Hunan Tianyan Machinery Co., Ltd. (hereinafter abbreviated as Hunan Tianyan). It is understood that Tianyan FAW Xichai CA6DL supercharger production line was built by Tianyan Company to upgrade and upgrade the existing supercharger assembly sub-branch. The annual production capacity is 220,000 turbochargers, and it passed FAW in November 2011. Xichai expert group on-site inspection and acceptance. As an important component company of China Changan Automobile Group, Tianyan Company has produced and sold more than 3 million supercharger units thanks to its supercharger production R&D technology for many years. As the core supplier of Xichai, its supercharger supply accounted for more than 35% of the total installed capacity of Tincan, and was awarded the title of â€œBest Supplierâ€ for many years. The establishment of dedicated lines plays an important role in boosting the production capacity of turbochargers, safeguarding the market, promoting strategic cooperation, and achieving mutual win-win results. The use of special manufacturing lines for production ensures the precise control of the various elements of the product realization process, reduces or eliminates variables in the manufacturing process, and provides better protection for quality and cost control. Such as to reduce the value of 20% of the value of the inventory of the cost of creating favorable conditions. FAW Xichai is one of the oldest diesel engine plants in China. In 2010, it ranked third in the industry with a production and sales breakthrough of 435,000 units, and the total asset contribution rate and total asset turnover rate ranked first in the industry. Since its L/M series diesel engine was put on the market, it has formed a good reputation in the market and users due to its outstanding performance advantages. Among them, 6DM diesel engine won the only â€œ2011 engineâ€ award for industrial heavy-duty engines. Xichai has established a strong supply chain system with â€œthe same goals, sharing benefits, and sharing risksâ€ as an important strategic task for the next five years. This measure will enable Xichaiâ€™s engine quality assurance support and procurement capabilities to be improved. The deepening of supply chain management is conducive to the long-term development of the â€œTwelfth Five-Year Planâ€. Qian Hengrong, General Manager of Wuxi Diesel Engine Factory of FAW Jiefang Automobile Co., Ltd. attended the ceremony. Wang Yan, general manager of Hunan Tianyan, gave a welcome speech. Qian Hengrong issued a special line certificate to Hunan Tianyan and jointly unveiled the production line with Wang Yijun.